Vesta-Linnéa wants to go outside. She wants to and she doesn’t want to. Her sister cheers her up with a chocolate and they start playing. Suddenly her sister asks how it is that Vesta-Linnéa is so sad at times. “I always want to get up and play!” says her sister. 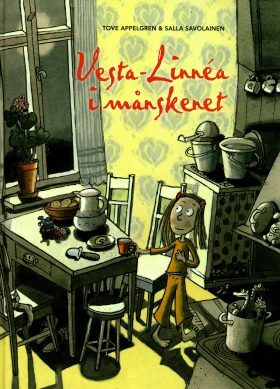 Vesta-Linnéa doesn’t know why but then starts thinking about being sad. How sad can you be? But she also thinks about happiness and what makes her happy. Mum, pancakes, sisters… How does that work? The story offers a wonderful combination of philosophy and insight, valuable to children and adults alike.